Cars streamed through the gate and the food line was long, as nearly 350 people – many of them children – descended upon Frontier Park Tuesday evening for the dedication of the long-awaited new playground known as the Big Toy. The ceremony was cause for celebration at one of Pierce County’s largest parks, located on Meridian Avenue in Graham, and generated a slew of dignitaries, kids and local supporters. Prior to the ribbon cutting ceremony for the new playground, there were games and activities on the field for the children hosted by the Pierce County Companionship Coordinator, Jen Sergent and her staff. Also, hot dogs, chips and beverages were served to the large crowd by the Chuck Wagon, operated by Pierce County’s 4H Horse Department. The food was provided by Apple Physical Therapy, which has a practice just across the street from the park. “Nothing better than a home cooked hot dog in one of Pierce County’s finest parks,” Kravit-Smith said as she publically thanked Apple for the support. Dignitaries included Pierce County Executive Pat McCarthy, (far left); Kathy Kravit-Smith (in red), Councilman Roger Bush, (in blue), and Director of Washington State Department of Parks and Conservation, Kaleen Cottingham, (center). 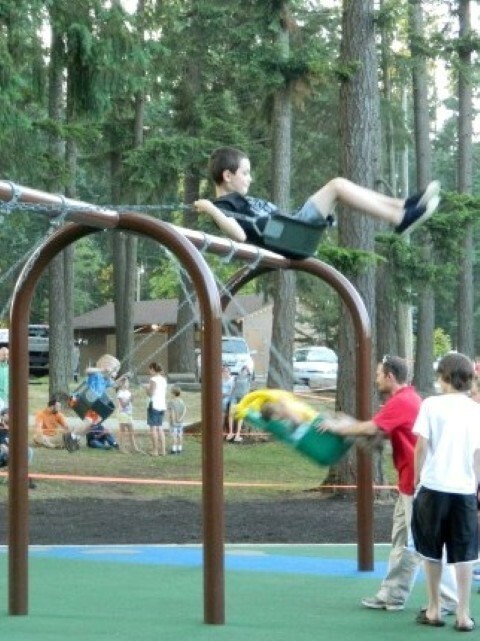 The original playground equipment was installed in 1985, but by 2009 was deemed out of compliance with national safety standards by Pierce County’s Certified Playground Safety Inspector. The timeworn equipment was immediately removed, leaving the park, which is home to many community events each year including the Pierce County Fair, without any designated play area. Just months after the old playground was declared unsafe, students from Bob Hansler’s 5th grade class at Kapowsin Elementary School decided to lead community efforts to raise funds for a new playground that could be used by children and families of all abilities. They expressed their desire to their teacher, who was impressed with their level of enthusiasm. Hansler furthered the process by contacting Pierce County Superintendent Recreation, Scott Hall. Hansler said the students sat in stunned silence after hearing this news and their enthusiasm seemed to have faded quickly. Hansler and his students embraced a full-fledged community effort to find the money for the new playground. “Ultimately, this was all made possible because a group of ten and eleven year old kids, who are now entering the 8th grade, believed they could make a difference,” voiced Mr. Hansler. 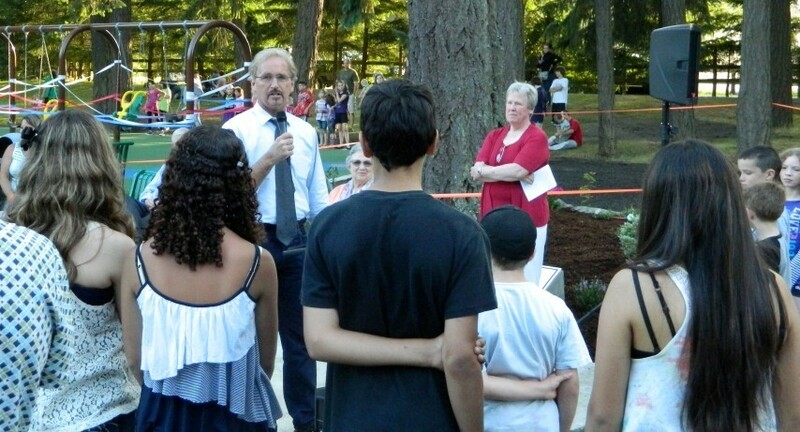 BSD teacher Bob Hansler addresses some of his former students – now in the 8th grade – who were instrumental in raising the monies necessary to build the Big Toy playground. In addition, one of the student’s parents, Sara Lamrouex, came to the classroom and promised the children she would work to help raise the money for a new playground. Honoring her word, she started the ‘Big Toy Team’ to raise funds, and met with local community, county and state leadership, such as the Graham Business Association and State Representative Tom Campbell, as well as organizing multiple fundraisers. Many of those civic leaders spoke Tuesday night about how proud and excited they were with the efforts and collaboration by so many to make the new playground a reality. Attending were State Senator Randi Becker (R-Eatonville) and Kaleen Cottingham, Director of the Washington Recreation and Conservation Office. 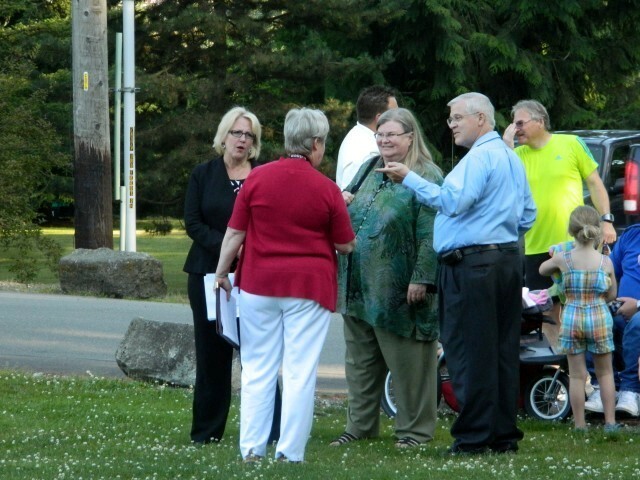 Many of the Pierce County Council members also attended, including its council chair Joyce McDonald, along with councilman, Roger Bush, who oversees Graham as part of his district. Bush reminded the crowd about the many improvements that have been made to Frontier Park in the last ten years and that the new playground was a great addition to the overall plan. “We have a vision going forward to not forget Graham and a place of gathering for our people in this community,” said Bush. 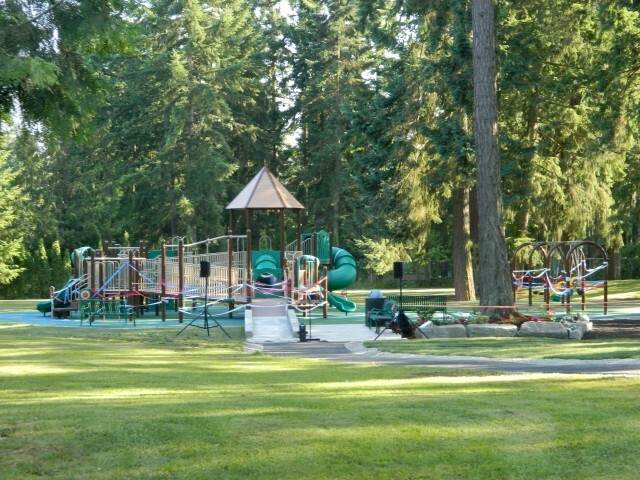 Along with the efforts of the students and some funding from PierceCounty, a matching grant through the Washington Wildlife and Recreation Program was awarded to complete the new play area project. The new 5,800 square foot playground features slides, talk tubes, a tunnel, overhead ladders, bridges, crow’s next, swings, climbing wall, sky wheels and more. The access ramps and colorful recycled rubber surfacing allows easy access and improved safety. Additional access improvements were made in the park by renovating the existing parking area and paving a walkway from the parking lot to the playground. So, after nearly three years of waiting, excitement built for the children who couldn’t wait anymore and they inched closer to the new playground behind the speakers. Lamrouex, as the final speaker, noticed her cue and quickly summed up the reason for the celebration. 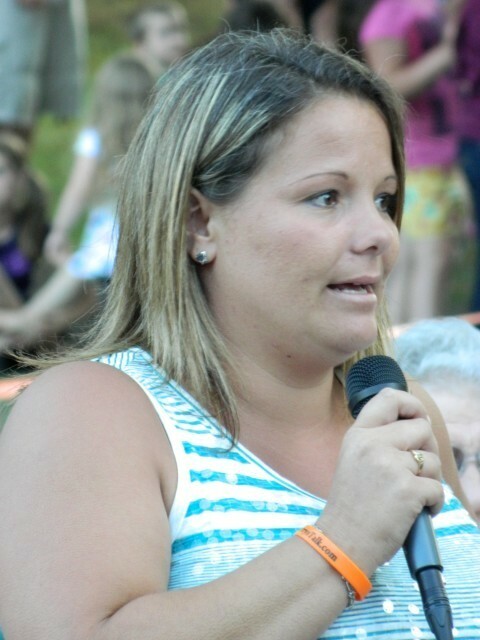 Sara Lamereoux, addressing the youth and families gathered at Frontier Park for the dedication of the new Big Toy playground. This entry was posted in Graham News, Josh Magill. Bookmark the permalink. I live in Charleston SC & my family took my siblings & I on vacation to Mt.Rainier back in the summer of 2003. I fell in love instantly & I’ve been to alot of places all over America. It’s my ultimate dream to live there 1 day. I’m very agnostic but when I hiked there I felt like there must be a God for a place so beautiful & serene to exist. I envy anyone who lives there!